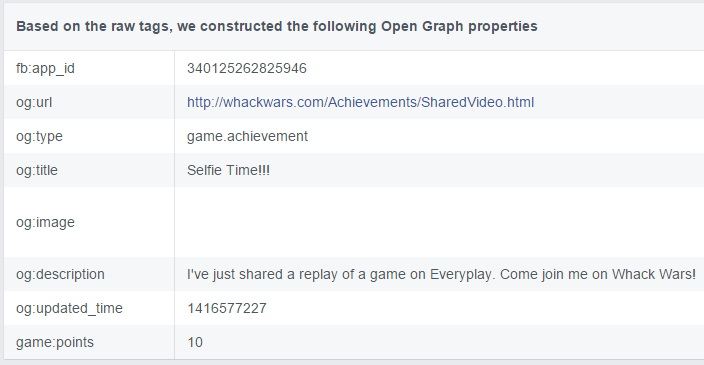 The first step is to create and register the achievement as a Facebook Open Graph object. Open Graph is a strongly typed API provided by Facebook consisting of objects and actions. Objects are the ‘nouns’ or targets for actions taken by people in your application. ⇛ og:type – This is a fixed value. It needs to be “game.achievement”. ⇛ title – The title of the achievement. ⇛ og:url – Leave this field blank for now. We will update it later on! ⇛ og:image – The url to the image that you want to be displayed in the achievement. ⇛ game:points – The amount of points this achievement gives if completed. ⇛ fb:app_id – The App ID that owns this achievement. After the file is created, we need to upload it to a server (You can use Dropbox Public folder if you don’t own a server). After the file is uploaded, you need to get the link of the file as a public accessible URL. Once you have this URL, you need to edit the file again, and put it in the og:url property, that we left empty on purpose, and RE-UPLOAD the file. (make sure that after you re-upload the file, the link stays the same!). 1. Select the application to which you want to register the achievement. 2. Click on Get App Token, to use the token of the app, and not the users access token. If all the information above is correct, we should the console return us a ‘true’ as a result. Now that we have our achievement uploaded and registered, we need to make the appropriate call from inside Unity to reward the player the achievement. For this tutorial, we assume that you already have the Facebook SDK up and running inside your project (the user must also grant publish_actions to be able to post achievements to his wall). With this class inside your project, with a call to GiveAchievement with the correct URL, you can have your game post beautiful achievements in no time! 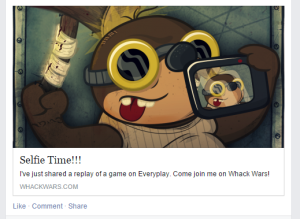 Make sure to leave us a comment with any doubts, questions or future topics to these series of post about how to integrate Facebook within your Unity3d project. Hard worker, truly passionate, and really efficient programmer. Problem solver by nature, and with the coding philosophy: the simpler, the better. I’m not sure I quite understand what you want to achieve. What do you mean by ‘publishing the user’s status’? Do you want to post something in his timeline? I can’t find achievementUrl. Please help. Can we use this way for Unity Android Build.